Colossians 4:6 (NKJV) Let your speech always be with grace, seasoned with salt, that you may know how you ought to answer each one. Knowing how to answer some people can be a challenge. What you’d like to say and what you should say might be miles apart. We’re 15 days past the closing date that was on our sales agreement for the home we are in the process of buying. We have quickly complied with all of the requests for the various pieces of information the bank and the title company have asked for…each time, hoping it would be the last thing they would ‘need’ before we would be able to sign the papers and take possession. Last night we got an email from the title company saying that the seller would like to postpone the closing until the end of the month—two more weeks. I had to revise my return email several times before I actually sent it. In the first version, I was downright ticked, and my words showed it. It felt good to hammer out my feelings on the keypad and see it all on the screen—but of course after I did my proofreading, I knew it should be edited. I changed a word here and a phrase there. Then I read it again, and saw more things that probably wouldn’t get me anywhere. Yesterday and today, I have had to write emails and make phone calls to people asking them to please hurry it up, in a way that would not offend them, yet letting them know we need to get things wrapped up. It’s hard to be in a position where you’re at the mercy of other people who can decide how fast they want to move. I think some people actually enjoy the feeling of power they get when they know you are at their mercy. At times like these, I have to really be careful that I don’t come on too strong. In the past, I wouldn’t have given it a second thought. I would have just jumped in with both feet and given them a piece of my mind…but that’s the past. That’s who I used to be…not who I am today. I can still get very frustrated when I’m under pressure and ‘between a rock and a hard place’, but I try to remember that God is ultimately in control. 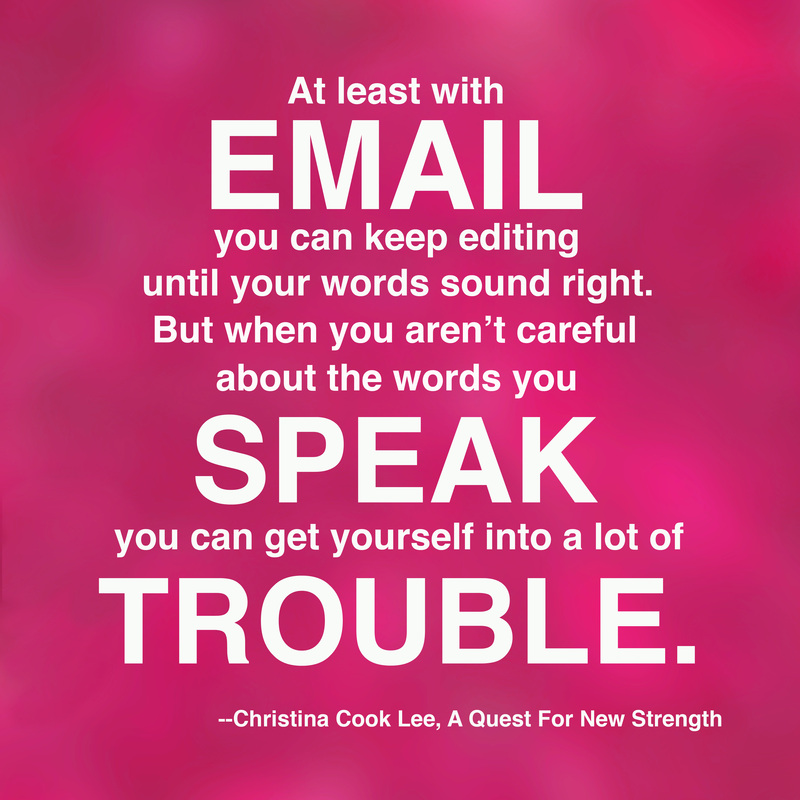 At least with email you can keep editing until your words sound right, but when you aren’t careful about the words you speak, you can get yourself into a lot of trouble. There is an old saying that ‘You can attract more flies with honey than you can with vinegar.’ If you’re in a situation where the person who is being difficult has control over whether you will be able to complete a negotiation in the way you’d like to, or not—then you’d really better watch what you say and how you say it. Blowing off steam and speaking your mind—even if you’re right—will not produce the results you want. Sometimes it’s better to just not say anything for a while, if you feel like you’re ready to explode. It’s that Biblical principle of being ‘quick to listen and slow to speak’, found in James 1:19. If you’re in a position where you feel like you just can’t compose yourself enough to say things in an honorable manner, maybe it would be better to just say, “You know, I think we’re going to have to put this conversation off for a bit, can I get back to you?” or something to that effect. It takes wisdom and self-control to get through things that drag on and just seem like they’re never going to end. Sometimes there is only so much you can say or do. If we’ve committed what we are doing to God, then His timing is part of what we have to accept. When you’re in a tough spot, it might help to remember to smile—or at least not look angry—even if you’re typing an email and no one can see you. A smile can make a big difference in how we sound and how people perceive us. It also might help to consider the kind of day the person who you’re dealing with might be having. Possibly they’ve had one ‘problem person’ after another and now, you’re giving them a hard time, too. If you try to be compassionate about their workload and what they go through—they will see you in a different light than all the other people who never give a hoot about them. Declaration: I will find new strength by using wisdom and self-control in all of my communication, written and verbal. I will carefully consider how I should respond to everyone. All NEW STRENGTH posts are Copyright by Christina Cook Lee as of the date they were written and posted. Please request permission to re-post or re-blog. This material will be published as a book in 2014, by the grace of God. To subscribe to New Strength, select ‘follow’ in the upper left corner of this page. You are welcome to share my blog, but not copy and paste. I don’t recall visiting your blog, but thanks for dropping by. All the best!